Saturday saw the Easter edition of the Saldanha 800m top end runs return to a sunny Saldanha airstrip. Spectators weren’t disappointed with a record run of 256km/h by a twin turbo XR8 Sierra, closely followed by a 600kw supercharged Lumina pickup crossing the line at a respectable 252km/h. The highest speed recorded by a bike was by a Hayabusa doing 277km/h. The danger of these types of events was made all too apparent when one of the bikers missed the breaking point and put her bike down at speed, fortunately she was only slightly injured and was only taken to hospital for a checkup. Big up to the guys from West Coast Racing (www.westcoastracing.co.za) for upping their game and pulling off an awesome event. 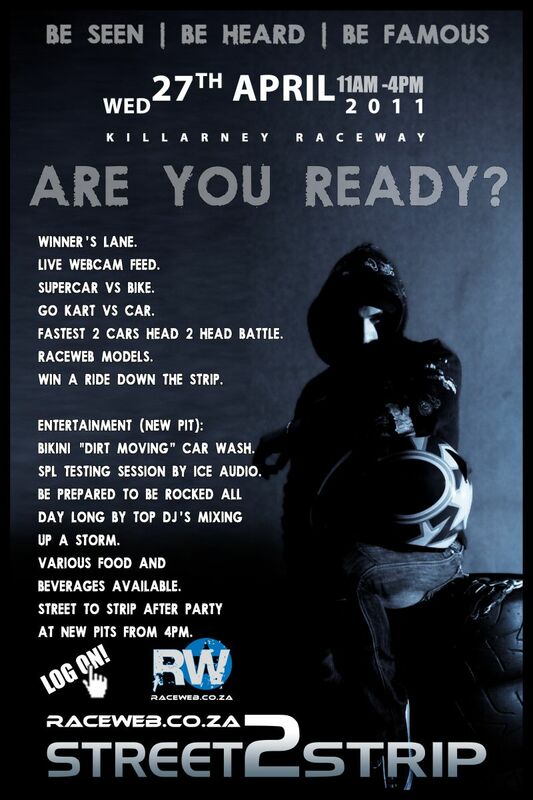 Raceweb.co.za Online Magazine will be hosting the Street2Strip side of the event and will be adding some interesting flavor to the evening. See who races at Street2Strip! All race entrants will be added to an online Raceweb database where future races and challenges can be set up online and can then be taken to the strip for everyone to see! All you have to do is LOG ON and make the challenge! What a great day’s racing last Saturday. The highlight of the day has to be Herman Mostert’s 9.349s run in his Nissan “not so 1400” bakkie and I think his run sparked something in the bikes. They where running mid 9s all morning but kept dropping their times after Herman’s blistering pass, I think I heard that the fastest time of the day for a bike was around 9.1s. Other highlights have to be Pdubs running a 12.4 in his Focus RS, the man’s just hooking it up, and Marlize Hoon setting a PB and filling the trophy cabinet, nice one Marlize.